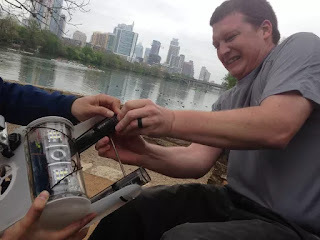 James brought the team together and pitched the idea of building an ROV to explore Jacob's well. We call him the official unofficial leader. Or captain. Dan started out as the group photographer but he has become more involved in the build and exploration processes as the OpenROV grows on him. Russell and Victoria Hatch - Thanks for allowing us to test in your private pool. We would not have been at ease testing the ROV in public and you made it easy and comfortable for us to test it out. We hope to return soon! Beth and David - Thanks for helping us at the apartment pool and keeping us fed. We hope to see you again soon. Thao, Hai, Moira, Patrick - Thanks for contributing to our first ever fundraiser. Your financial support not only helps us continue the project but also puts pressure on us to succeed. We don't want to let you down and we won't stop chasing this adventure.